Eddy Kitsis and Adam Horowitz offer a delightful treat to the avid Once Upon a Time fans by participating in a Q&A session. During the Q&A, some OMG spoilers were released. The producers exposed that The Huntsman would return in the season finale! Eddy joked by warning how handsome he has grown since the murder of Sheriff Graham took place. Kitsis went on to say what an amazing actor Jamie Dornan is and how exciting it will be to see The Huntsman return in the finale. 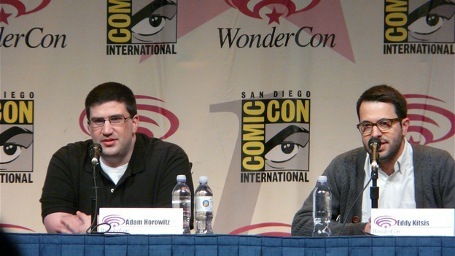 Eddy & Adam, the former LOST writers, also told the crowd they have strategically inserted some amazing Easter eggs throughout the series. They are going to continue to slip in these delightful treats to keep fans on their toes. The next LOST referenced was hinted by Eddy telling us to, “look up in the air” for the upcoming episode. Not to make any assumptions, but we have heard them say this once before when we questioned who Henry’s father is. Could it be? What do you think? How do the producers keep everything organized with so many storylines and characters involved? Eddy said it is not simple. In the writer’s room, there is a timeline that continuously gets added and basically they are building a bible. Are there any obstacles of having Emma as the “savior,” especially when the audience knows Henry is correct about the book? Eddy responded with it is a challenge. This also leaves the audience to wonder how Emma could not believe. It makes things difficult, but it should be that way. Adam said if she believed right away, then the audience would scream foul. It is a lot to take in and absorb. Emma’s journey has to show the audience it is going to a big one. Eddy continued to say it has to be a big one for us as well. There has been amazing guest stars – Alan Dale, Giancarlo Esposito and Richard Schiff. When developing these characters, are these actors in mind for the role already? Eddy said yeah, a perfect example is Regina’s mother that is coming up soon. Barbara Hershey is playing this role. Giancarlo, him and Adam loved from Breaking Bad. Alan Dale and Emilie we already had a relationship with because of LOST. So often, the guest stars come to mind immediately. We almost scream at moments like OMG! This person would be perfect for this character! Adam mentioned how the entire process is completely collaborative. The process is developing the character, what the talent can bring and character experience for the audience. In the end, you just hope that the final piece is more than expected. When will season two of Once Upon a Time air? cant wait for season finale! the weird thing is there wont be a happily ever after for some of the characters. im still waiting for snow to get poisoned though. Rapunzel is a story by the brothers Grimm about a girl with looooooooooooooooooong hair that is being held captive in a tower by a witch. And rapunzel lets her long hair down the tower to get the witch up, whenever the witch wants to get into the tower. One day a prince comes by and wants to be with Rapunzel but the witch cuts off Rapunzels hair, and hurting the prince.. It ends with the withch being imprisoned herself in the tower, and Rapunzel and the prince get to be together 🙂 Disney have recently made a movie (cartoon) based on this fairytale, called Tangled :)Its a great movie ! Uhmm… As most other Disney movies Mulan and the Little Mermaid is both based on fairytales. Mulan is an ancient chines story which is much older than most european fairytale. The only reason you can say that the Little Mermaid differs from classic fairytales is that there is a known writer. His name was H. C. Anderson. If you like the movie you should really read the original story. It’s absolutely beautiful, sadly Disney made a lot of changes is the movie. Just to point out there are many other characters in storybrook which has Disney-movies ex. Snow white, Benjamin Cricket, Cinderella and more :). Given that ABC is owned by disney, i feel we will be seeing alot more of our favorite disney characters. I read we may be seeing Aladin. As for “Little mirmaid” I see we will be seeing a swimmer… makes scene seeing as how else will they make a modern world mirmaid? I could see them going with a girl who cant speak for Ariel hoping they bring in ursula too… I really hope they bring in more villians the next season maybe a big good vs evil situation…. Most of the stories in this also have known writers, being the Brothers Wilhelm and Jacob Grimm (at least, I believe they’re their first names, but nonetheless, Brothers Grimm). But as Disney has a stake in this, it would surprise me if they started fishing outside their own film history pond before tackling another. They’ve still yet to reveal Sleeping Beauty (even though Malificent is revealed), Rapunzel, Peter Pan, Ariel, Alice (though we do have the Mad Hatter) and heaps of others. I’m interested to know if the fairies will regain their magical skills and, if so, will Pinocchio/Boothe be brought back to life? but doesn’t Ariel turns into sea foam? she never had a happy ending on the original story. No, she didn’t turn into foam. That was the bitter end for all mermaids but “ariel” did actually become a “Daughter of the winds” if I recall correctly. In the season finale, the moment I saw the guard with bow and arrow, I automatically shout “THE HUNTSMAN!!!!”.. LOL.. Btw, can’t wait for season 2..!!!! Peter Pan is no longer going to be in season two. They had rights issues, so they are leaving him and Captain Hook out. Shame they dont have rights issues with Mulan being in it. Ariel I can tolerate but Mulan is just a bit ridiculous. Have a open mind she might be Rumple’s wife mother of his son. She might joined the army to defend his honor once they found out she was female they killed her. The Brothers Grimm don’t have a monopoly on fairytales. A fairytale is one which is of mystical and mythical origins containing fantastical elements. Yes, mostly in western culture, Snow White and Cinderella are at the forefront, but that doesn’t mean Peter Pan (arguably the youngest of the fairy tales around) and Mulan (unarguably the oldest of the discussed stories) belong elsewhere. And for note, Snow White was adapted into its best known story by the Grimms, not created or invented by them. She was already a folklore character for hundreds of years before they were born, and expected to have been Russian in origin. Also, it was Walt D who added the seven dwarves names we all know and love. BTW: The genie in the lamp wasn’t a Grimm tale either, it’s an ancient Arabic legend. Ironically, it bears more credit as a piece of fiction in our technologically advanced age. It would be almost easy to put the works of the Brothers Grimm as a monopoly, given the enormous amount you could use (Tom Thumb, Jack and the Beanstalk, the Emperor’s New Clothes, etc etc). Oddly, they’ve expanded King Midas’ story and given his daughter IRL the name Catherine and her husband in fairytale land the name Frederick (one of my favourite Grimm tales is Catherine and Frederick). Second of all why does everyone assume that the Siren in Fairytale world was Ariel? If you haven’t noticed we are getting mixed the whole imaginative world here Myths in which we can you won ‘t believe find the sirens / mermaids are in it. (even in greek mythology they couldn’t say if was the other part->from face down a fish tail or were they 3/4 birds=>but the ending was usually the same for the sailors). Sure many of the fairytales were filmed by Disney or W.D.Pictures but also we are people and tend to label fictional charecters as fairytale characters if it’s that Sleeping Beauty, Harry Potter, Robin Hood, King Arthur or even Sherlock Holmes. By the way the city is called Storybrook so they have freedom from greek/british legends through nursery rhymes and children books to books for youth and young adults. Because every type they choose has a story. So if they would choose for next character to find to be The Little Prince(Saint-Exupery) you can’t say it’s not a story character it’s hard to even say it’s not a fairytale character but deffinitely he is a fictional character. The human factor here exists and like I said the town is called Storybrooke so STORY being a part of the name execuses every fictional character we can think of here Disney or No Disney Character. But I really hope we won’t see Mickey Mouse or Donald Duck here. I totally understand why Mulan because she perfectly fits in the feministic frame of Once upon a time. Think about it the girl who pretended to be a boy to go to battle as a mighty female warrior. And I Like it that the stories aren’t all so sweet you can put your bowl under the TV and have a diabetes disease for life. I love the show to authors try to go outside the safe Disney line(like you did with Hansel and Gretel). Really Can’t wait for season 2. I think you need to calm down, it’s a tv series so a lot has been left unanswered so a lot of what people say is speculation and no-one said that ONLY the grimm brother stories are fairytales. I hope Henry’s father is Baelfire. It’s funny how everyone keeps repeting “the grimm brothers fairytale” as if they wrote them. The only thing the Grimm brothers did was collect a bunch of classical fairytales and turned it into a book…..
Okay…that mail was for the producers’ eyes and I am sorry if I confused anyone outside the professional side of TV/film production. You should have princess jasmie! people need to understand that Once Upon A Time is not based on Disney characters. It is just based on fairy tales. Just wanting to clear that up, seeing as a lot of people who are commenting keep referring to Disney.. Awesome show! And can’t wait till season 2! Should be sometime in September or October 2012.
has anyone thought of these worlds as connected realms much like parallel universes? Basically how the mad hatter (Jefferson) can travel between the worlds of fairytale and wonderland: Rumple has just opened the connection between the worlds making it possible that not only fairytale characters but storybook characters of any kind would now have access to storybrooke. The simple fact alone that Jefferson is supposedly in this show originally from fairytale land and just trapped in wonderland for a time i.e. they can suggest that any character transends the books or films they are depicted in and originated from this land. Making it possible for Ariel, Mulan etc to be involved in the next series. You could even have hunchback of notre dame as the controller of the town clock..it doesnt have to be brothers grimm or disney. Anythings possible with this show. I wonder if the producers of “Once Upon a Time”, when they speak of working in Vancouver, B.C. and praising to the skies the wondrous crews up there in all elements, even (gasp!) rain and wind!!!! Having worked on crews in Washington State for thirty years, I can attest to the professional level of the film community in the Pacific Northwest INSIDE THE UNITED STATES! Your effusive praise of the Canadian crews are a HUGE slap in the face for the crews in the Seattle/Portland area while you fly over us to save money. We have lost billions (that’s Billion with a “B”) in income over the past decades while YOU have CREATED a film community for Canada! And not just the principal photographic team with its camera crew, sound, wardrobe, makeup, hair, grips, electricians, location scouts, carpenters, greens keepers, etc., but hotels, restaurants and all the support services infrastructure that are struggling to make ends meet. You fly into Seattle with a skeleton crew, shoot 2-3 days of exteriors to establish Seattle as the principle location and then shoot the REST of the movie or series in Vancouver! So STOP all this BS about you supporting the cast and crews of the United States all the while knifing us in the backs while we slowly die from starvation. Think I’m exaggerating?? Enough of the cutsie pie responses to questions about where you choose to shoot! At least be HONEST about your money grubbing ways to line your own pockets at the expense of the invaluable folks who work INSIDE the borders of YOUR country! He is still a beast and a creature of magic. He knows the value of true love yet he would sacrifice everything just to get his magic back. Surely he will become the dark one again. The question is, is he doing this for his son, for emma, for belle or for himself. im inclined to think the latter. he is a selfish being whose only hope of redemption and freedom was his son who he lost. It will be interesting to see if baelfire does turn out to be henry’s father, although the chances of emma and baelfire connecting in their real world are staggering especially if the curse and emma didnt exist at the time baelfire left. This Is My Favorinte Show EVER!!!!!! I Love It Sooo Much!! Im Def Hooked. Cant Wait For Season 2! !